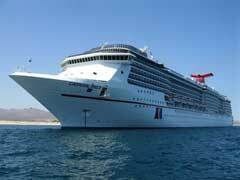 The Carnival Cruise Elation can hold up to 2052 passengers and has a crew of 920. At 855 feet long this ship calls New Orleans its home port and travels to the Caribbean. Her sister ship, Carnival Cruise Imagination has the same specifications, though calls Miami home and cruises not only to the Caribbean but the Bahamas as well. The Elation is a ship dedicated to art, while the Imagination is dedicated to bringing fantasy and ancient legends to life. Both have wonderful amenities including stage shows, water fun, comedy clubs, an atrium, casino and spa and both have varied dining opportunities including The Mongolian Wok as well as the main dining room, piano bars and fun nightlife for all ages. Carnival cruise ships larger in both size and passenger space include the Carnival Cruise Triumph at 2758 passengers and 1100 crew all in 895’of fun and the Carnival Cruise Conquest with the capacity for 2974 passengers and 1150 crew which comes in at 953’. Triumph’s home port is Galveston and she is dedicated to the great vacation cities of the world, with dining options from South Beach, Paris, California and Vienna to name but a few. Her sister, the Conquest calls several ports home including San Juan, Miami and New Orleans, and is inspired by the great impressionist painters, as evidenced by the many galleries onboard and the paintings throughout. Both of these ships offer cruises to various ports of call in the Caribbean as well as the amenities on board that make Carnival a great choice. The big boys of the Carnival cruise ships include the Carnival Cruise Dream and the Carnival Cruise Magic, both with a passenger capacity of over 3600 people with 1367 crew members. Both of these ships are an impressive 1004 feet long and cruise the Caribbean in style. The Dream calls Port Canaveral home and boasts not one, but two double tiered dining rooms, the Ocean Plaza, an amazing waterslide and the Punchlines comedy show. Her sister the Magic is based in Galveston and has an incredible half mile outdoor promenade deck, the Carnival WaterWorks, and the Sportsquare fitness and fun club, as well as the Redfrog Pub for delightful new beers you can’t get on land. No matter which Carnival cruise ships you choose, you can rest assured that you will have an incredible vacation with the one and only fun ships, and that is before you ever get to your destination.